There is currently just the 1 ferry route running between Lanzarote and La Palma operated by 1 ferry company – Trasmediterranea. The Arrecife to Santa Cruz de La Palma ferry crossing operates weekly with a scheduled sailing duration from about 32 hours 1 minute. Whilst we’ve taken great care to ensure the information on this page is correct, as the frequency and duration of crossings on all routes can vary from time to time we’d advise that you get a live quote for current availability on this Lanzarote La Palma crossing between Arrecife and Santa Cruz de La Palma. 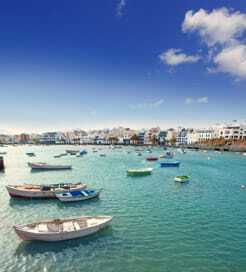 Lanzarote is the fourth largest and the most easterly of the Canary Islands, located in the Atlantic Ocean off the coast of Africa. Born out of volcanic activity more than twenty million years ago, Lanzarote features spectacular countryside and out of this world scenery. With constant warm, spring weather, it truly is a great holiday destination to be enjoyed all year round. To the south east of the island you’ll find Arrecife, its capital and main departure port. 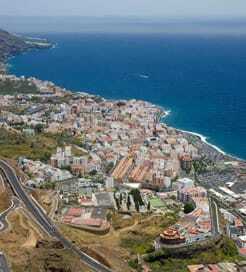 From here you can connect with other canary islands including Tenerife, Gran Canaria and La Palma. Ferry crossings between Lanzarote and mainland Spain are long but operated by modern ferries which provide a pleasant journey. Playa Blanca on the south western side is the port of departure for crossings from Lanzarote to neighbouring Fuerteventura.